I will begin this discussion with the modern panacea for recession: "Loosen monetary policy, let your currency depreciate boost your export and plough back out of recession". This looks efficient as well as effective in most cases. Although the sanity of increasing liquidity in the market was not suggested to the Asian tigers or the Argentinean government during the crisis, still it is now a well established fact to do so in order to fight recession. However, it might not give its usual results when we look at America. The USA is a net importer with huge trade deficit and USD is the global trade currency. Many other countries are dependent hugely on trade with the USA and also dependent on the value of USD. This has propelled most of the developing countries to maintain the value of their domestic currency against dollar to keep them competitive in the export market and also to prevent losing the value of their forex reserves. These nations which include the likes of China, Russia and India, have chosen domestic inflation over stronger local currency (Click here to better understand this phenomenon). Another factor which plays a role in keeping the dollar strong against other currency is that US lies in the centre of today’s mono polar world. 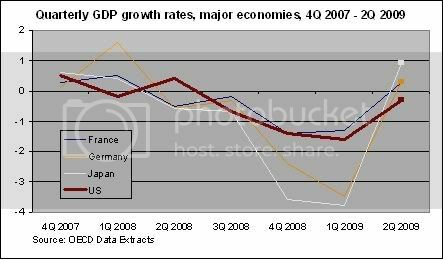 Thus no major economy across the world stays untouched from US recessions. 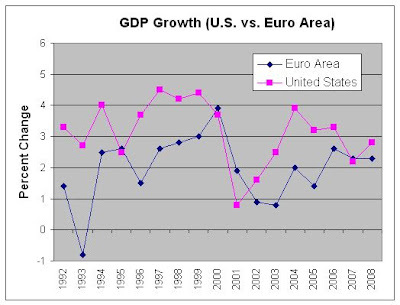 You can see on the graph how Euro area follows US GDP growth rate. The democrats in US are currently using a mix of fiscal and monetary policy to provide stimulus to the economy. But the majority money till now has gone into saving the collapsing financial system which in turn used the money to write off bad debts. The road from here on would need a script for creating more jobs and stimulating demand. Let’s see what US does now, keeping in mind that USD hasn’t lost much against other major currencies. Will the expansionary monetary policy be used again or the fiscal policy will get its due? With interest rate already near 0% there is not much scope left here!